Vorarlberg, situated in the western part of Austria, features very different landscapes: on the one hand Lake Constance at 400 m/1312 ft. and on the other hand glaciers at 3000 m/9843 ft. – all within one hour driving distance. Winter vacationers choose Vorarlberg for its famous ski resorts, perfectly groomed cross-country skiing tracks and well maintained hiking paths through snowy meadows. The resort Lech - Zuers is known among skiers around the globe but managed to keep its authenticity. Try one of the new winter sports if you do not like to ski: snowblades, snowfox, snowscooter, snowcycle or snow tubing. After so much snow, there is also a wide program of activities for visitors during the warmer time of the year. Visitors in summer have the agony of choice between sports such as hiking, biking, golf, rafting, caving etc. Take a swim in Lake Constance and admire the beautiful mountain peaks in the distance. 6000 km/3728 miles of sign-posted hiking trails invite you to explore the shady forests and blooming meadows. In the Bregenzerwald you find many beautiful flower-decorated houses nestled between the mountains. The Montafon Valley in the south of Vorarlberg leads to the popular alpine road “Silvretta-Hochalpenstrasse”, a 22 km/14 miles road covering 800 m/2625 ft. in altitude and 23 hairpin bends. You get rewarded with a gorgeous panorama view of Piz Buin, the highest mountain in Vorarlberg (3312 m/10866 ft.). Castles and ruins, churches and cloisters were once places of refuge. Nowadays they can be visited. Historic buildings were witnesses of the past. Learn about their history and get fascinated by the old stories. Vorarlberg is not just a place with old buildings. It is also showing very modern architecture. Structures made of glass and wood with clear lines are recognized and known under “Vorarlberger Baukünstler” (Vorarlberg’s structure artists). This style is internationally recognized and a reason to visit and see this sophisticated simplicity. Vorarlberg also has a lot to say about festivals. The world-famous “Bregenz Festival” held annually in July/August is just one example drawing thousands of visitors to the shores of Lake Constance to view an opera on the world’s largest floating stage. 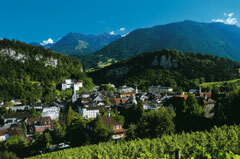 Vorarlberg’s neighbor countries are Germany, Switzerland and Liechtenstein as well as Tirol (Austria). Due to the closeness of these countries, the people in Vorarlberg speak a distinct dialect of German, making it hard for other Austrians to understand them (a similar dialect as spoken in Switzerland and Liechtenstein). Vorarlberg – a small region with many interesting places – it’s definitely worth to visit!